After battling Reapers of Chaos, mythological creatures and all-around evil classmates, Gwen Frost just wants to survive the rest of her semester at Mythos Academy. Learning how to use weapons seems like a good start, even if that means being taught by her unrequited crush, Logan. Maybe Daphne's suggestion of attending the Winter Carnival will turn things around and let her move forward? However, there is more than snow, boys and fun awaiting Gwen and her friends at the ski resort; Gwen will have to face the past once again and fight for her life. Kiss of Frost opens not long after Touch of Frost. Gwen works on improving her fighting skills after her fight with the Reaper Jasmine. Against the Spartans, Amazons and others at Mythos Academy, she seems at a serious disadvantage. However, her Gypsy gift of psychometry once again shows Gwen is not as limited in power and skill as she may seem, and Gwen discovers more about her role as Nike's Champion, maybe more than she bargained for! Even with this power and goddess-given mantle, Gwen is still dealing with her own sadness from her mom's death and Logan's rebuff of her feelings. While you definitely know you are dealing with teens, powers and battles aside, the emotions of the characters stay true to age and you can see true growth in them without belief-suspending leaps. I have really enjoyed Jennifer Estep's adult Elemental Assassin series, and Mythos Academy brings a lot of the same elements: a strong female lead; family interactions and issues; developing powers - all leading to a delightful book that makes me anxiously await the next in the series. Gwen is finding answers to some of the questions that were asked in Touch of Frost, good and bad, that will definitely push the storyline forward. There were some definite moments that were revealed far too early, but Estep countered those with some surprises towards the end. I believe some of the best parts of these books are the secondary characters: Daphne and Carson are back in the thick of things, and the introductions of Oliver and Kenzie, along with Morgan hints at some intricate relationships for Gwen and the future. Estep gives the "teen outcast" storyline a fresh twist with the Mythos Academy series. I will be waiting for the next book, Dark Frost, when it appears on shelves in June 2012. KISS OF FROST GIVEAWAY WINNER! 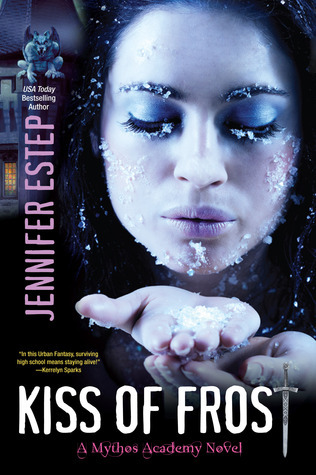 Congratulations goes out to JenniferK for winning a copy of Kiss of Frost! Jennifer, I will be sending you an email to confirm details. Many thanks to Kensington Books for supplying the book to the winner. And stay tuned, as I will be announcing another giveaway next week!